Financial Modeling training are all around the web and there has been lot written about learning Financial Modeling, however, most of the financial modeling trainings are exactly the same. This goes beyond the usual gibberish and explore practical Financial Modeling as used by Investment Bankers and Research Analysts. In this Free Online Financial Modeling Training, I will take an example of Colgate Palmolive and will prepare a full integrated financial model from scratch. 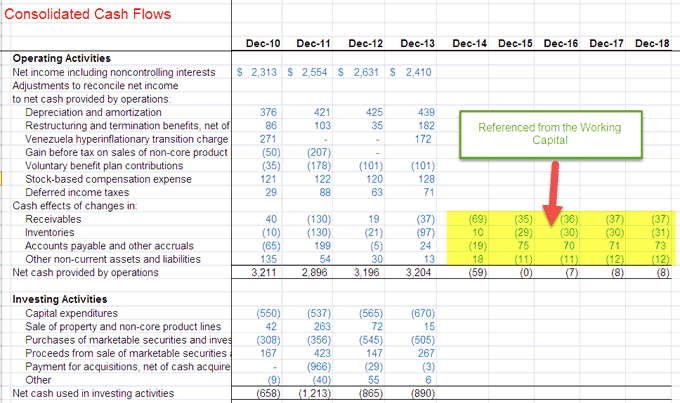 Step 3- You will be working on the Unsolved Colgate Palmolive Financial Model Template. Follow the step by step Financial modeling Training instructions to prepare a fully integrated financial model. Step 4 – Happy Learning! I have made an easy to navigate table of contents for you to do this Financial Modeling Training. If you are new to Financial Modeling, then do have a look at this guide on What is Financial Modeling? How to build a financial model in Excel? The core statements are the Income Statement, Balance Sheet, and Cash Flows. The additional schedules are the depreciation schedule, working capital schedule, intangibles schedule, shareholder’s equity schedule, other long term items schedule, debt schedule etc. In this financial modeling training, we will build a step by step integrated financial model of Colgate Palmolive from scratch. The first step in Financial Modeling Training is to prepare the Historicals. “Financial models are prepared in Excel and the first steps starts with knowing how the industry has been doing in the past years. Understanding the past can provide us valuable insights related to the future of the company. 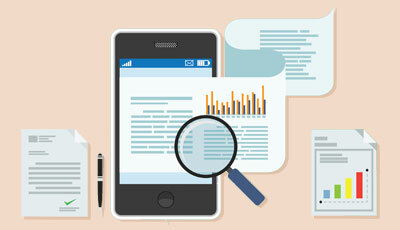 Therefore the first step is to download all the financials of the company and populate the same in an excel sheet. For Colgate Palmolive, you can download the annual reports of Colgate Palmolive from their Investor Relation Section. 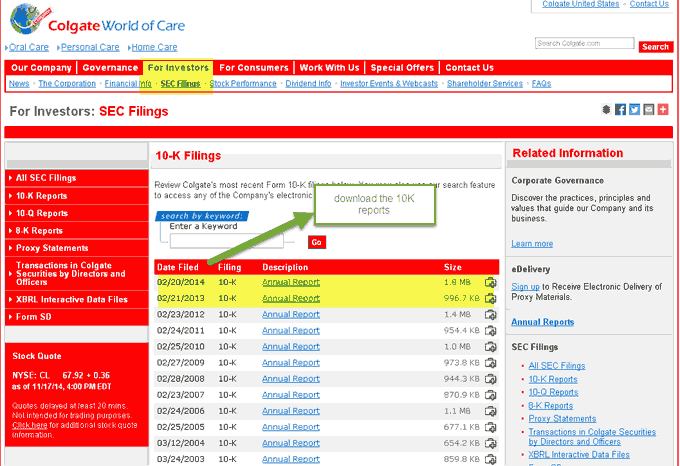 If you download 10K of 2013, you will note that only two years of financial statements data is available. However, for the purpose of Financial Modeling in excel, the recommended dataset is to have last 5 years of financial statements. Please download the last 3 years of the annual report and populate the historical. Many times, this tasks seems too boring and tedious as it may take a lot of time and energy to format and put the excel in the desired format. However, one should not forget that this is the work that you are required to do only once for each company and also, populating the historicals helps an analyst understand the trends and changes that were made in the financial statements. If you wish to skip this step, you can directly download Colgate Palmolive Historical Model here. The second step in Financial Modeling in Excel is to perform Ratio Analysis. IMPORTANT – Please note that I have updated the Ratio Analysis of Colgate in a separate post. Please do have a look at this comprehensive guide to Ratio Analysis. On the income statement, the vertical analysis is a universal tool for measuring the firm’s relative performance from year to year in terms of cost and profitability. It should always be included as part of any financial analysis. Here, percentages are computed in relation to net sales which are considered to be 100%. This vertical analysis effort in the income statement is often referred to as margin analysis since it yields the different margins in relation to sales. Net Profit Margin increased from 12.6% in 2007 to 14.5% in 2012. However, Net Profit Margin in 2013 decreased to 12.9%, primarily due to increased “other expenses”. 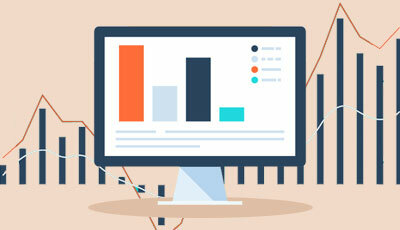 Horizontal analysis is a technique used to evaluate trends over time by computing percentage increases or decreases relative to a base year. It provides an analytical link between accounts calculated at different dates using currency with different purchasing powers. In effect, this analysis indexes the accounts and compares the evolution of these over time. 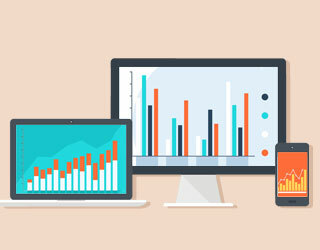 As with the vertical analysis methodology, issues will surface that need to be investigated and complemented with other financial analysis techniques. The focus is to look for symptoms of problems that can be diagnosed using additional techniques. We see that the Net Sales has increased by 2.0% in 2013. Also, note the trend in Cost of Sales, we see that they have not grown in the same proportion has Sales. Quick Ratio of Colgate is in the range of 0.6-0.7, this means that Colgates Cash and Marketable securities can pay for as much as 70% of current liabilities. This looks like a reasonable situation to be in for Colgate. 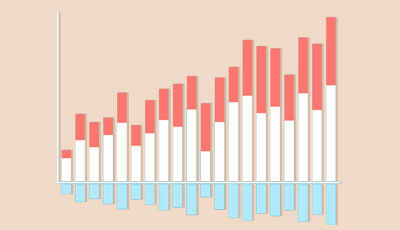 Cash Collection Cycle has decreased from 43 days in 2009 to 39 days in 2013. This is primarily due to the reduction in receivables collection period. As we can see from the above table, Colgate has a ROE of closer to 100%, which implies great returns to the Equity holders. However, the Interest Coverage Ratio is very high signifying less risk of Interest Payment Default. The third step in Financial Modeling Training is to forecast the Income Statement, wherein we will start with modeling the Sales or Revenue items. Sales Growth: Sales growth assumption in each period defines the change from the previous period. This is a simple and commonly used method but offers no insights into the components or dynamics of growth. Inflationary and Volume/ Mix effects: Instead of a simple growth assumption, a price inflation factor and a volume factor are used. This useful approach allows modeling of fixed and variable costs in multi product companies and takes into account price vs volume movements. Unit Volume, Change in Volume, Average Price and Change in Price: This method is appropriate for businesses which have simple product mix; it permits analysis of the impact of several key variables. Revenue based on installed base (continuing sales of parts, disposables, service and add-ons etc). Examples include classic razor-blade businesses and businesses like computers where sales of service, software, and upgrades are important. Modeling the installed base is key (new additions to the base, attrition in the base, continuing revenues per customer etc). Employee based: For example, revenues of professional services firms or sales-based firms such as brokers. Modeling should focus on net staffing, revenue per employee (often based on billable hours). More detailed models will include seniority and other factors affecting pricing. Store, facility or Square footage based: Retail companies are often modeled based on the basis of stores (old stores plus new stores in each year) and revenue per store. Occupancy-factor based: This approach is applicable to airlines, hotels, movie theatres and other businesses with low marginal costs. Since, we do not have any further information about the segments, we will project the future sales of Colgate on the basis of this available data. We will use the sales growth approach across segments to derive the forecasts. Please see the below picture. We have calculated year-over-year growth rate for each segment. Now we can assume a sales growth percentage based on the historical trends and project the revenues under each segment. Total Net sales are the sum total of Oral, Personal & Home Care, and Pet Nutrition Segment. Costs other than depreciation as a percent of revenues and depreciation from a separate schedule: This approach is really the minimum acceptable in most cases, and permits only partial analysis of operating leverage. Since we have already forecasted Sales, all the other costs are some margins of this Sales. The approach is to take the guidelines from the historical cost and expense margins and then forecast the future margin. For example, Cost of Sales has been in the range of 41%-42% for the past 5 years. We can look at forecasting the margins on this basis. Likewise, Selling, General & Administrative Expenses have been historically in the range of 34%-36%. We can assume future SG&A expense margin on this basis. Likewise, we can go on for another set of expenses. Using the above margins, we can find the actual values by back calculations. Also, note that we do not complete the “Interest Expense (Income)” row as we will have a relook a the Income Statement at a later stage. Interest Expense and Interest Income is covered in the Debt Schedule. Now that we have completed the Income statement, the fouth step in Financial Modeling Training is to look at the Working Capital Schedule. Note that we have not included short term debt and cash and cash equivalents in the working capital. We will deal with debt and cash and cash equivalents separately. With the completion of the working capital schedule, the next step in this Financial Modeling Training is the project the capital expenditure requirements of Colgate and project the Depreciation and Assets figures. In such cases, please have a look at the Cash flow statements where you will find the Depreciation and Amortization Expense Also note that the below figures are 1) Depreciation 2) amortization. So what is the depreciation number? If the company has provided guidance on future capital expenditure, then we can take those numbers directly. It is therefore recommended not to reconcile the past PPE as it may lead to some confusions. For estimating depreciation from Building improvements, we first make use of the below structure. The above process for estimating depreciation is used to calculate the depreciation of 1) Manufacturing Equipment & Machinery and 2) other Equipment as shown below. The sixth step in this Financial Modeling in Excel is to forecast the Amortization. We have two broad categories to consider here – 1) Goodwill and 2) Other Intangibles. Goodwill comes on the balance sheet when a company acquires another company. It is normally very difficult to project the Goodwill for future years. Most analyst’s don’t project goodwill, they just keep this as constant and this is what we will also do in our case. 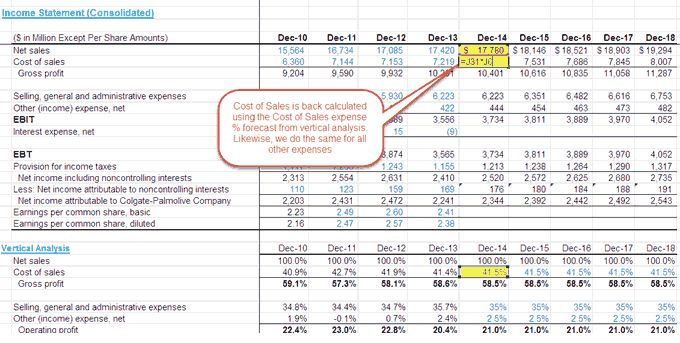 Colgate’s 10K report provides us with the details of next 5 years of amortization expense. The next step in this Financial Modeling Training is to prepare the Other Long Term Schedule. This is the schedule that we prepare for the “left overs” that do not have specific drivers for forecasting. In case of Colgate, the other Long Term Items (left overs) were Deferred Income Taxes (liability and assets), Other assets and other liabilities. Also, calculate the changes in these items. Please note that if we have kept the long term assets and liabilities as constant, then the change that flow to the cash flow statement would be zero. At this stage, assume that the future number of basic and diluted shares will remain the same as they were in 2013. With this we are ready to move to our next schedule i.e. Shareholder’s Equity Schedule. 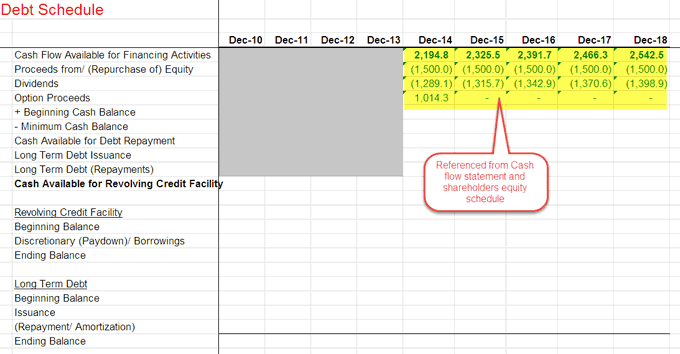 The next step in this Financial Modeling in Excel Training is to look at the Shareholder’s Equity Schedule. The primary objective of this schedule is to project equity related items like Shareholder’s Equity, Dividends, Share Repurchase, Option Proceeds etc. Colgate’s 10K report provides us with the details of common stock and treasury stock activities in the past years as shown below. Historically, Colgate has bought back shares as we can see the schedule above. Populate the Colgate’s shares repurchase (millions) in the excel sheet. Colgate has not made any official announcement of how many shares they intend to buyback The only information that their 10K report shares is that they have authorized a buy back of upto 50 million shares. In order to find the number of shares bought back, we need to assume the Share Repurchase Amount. Based on the historical repurchase amount, I have taken this number as $1,500 million for all the future years. In order to find the number of shares repurchased, we need the projected implied share price of the potential buy back. In our case, I have assumed that all future buybacks of Colgate will be at a PE multiple of 19x. From the summary of common stock and shareholder’s equity, we know the number of options exercised each year. Also, note that the stock options have contractual terms of six years and vest over three years. For simplicity sake, we have not projected options issuance (I know this is not the right assumption, however, due to lack of data, I am not taking any more option issuances going forward. We have just taken these as zero as highlighted in the grey area above. Additionally, the restricted stock units are projected to be 2.0 million going forward. With the information of dividends paid, we can find out the Dividends payout ratio = Total Dividends Paid / Net Income. We note that the dividends payout ratio has been broadly in the range of 50%-60%. Let us take an assumption of Dividends payout ratio of 55% in the future years. With the forecast of share repurchase, option proceeds and dividends paid, we are ready to complete the Shareholder’s Equity Schedule. Link all these up to find the Ending Equity Balance for each year as shown below. Also, the input weighted average number of shares and effect of stock options for the historical years. Step 10B – Link share issuances & repurchases from Share Equity Schedule. Basic Shares (Ending) = Basic Shares (Beginning) + Share Issuances – Shares Repurchased. we find the average of two years as shown below. Also, add the effect of options & restricted stock units (referenced from the shareholder’s equity schedule) to find the Diluted Weighted Average Shares. Now that we have calculated the diluted weighted average shares, it is time for us to update the same in the Income Statement. With this we complete the Shares Oustanding Schedule and time to move to our next set of statements. Find the year end cash & cash equivalents at the end of the year. 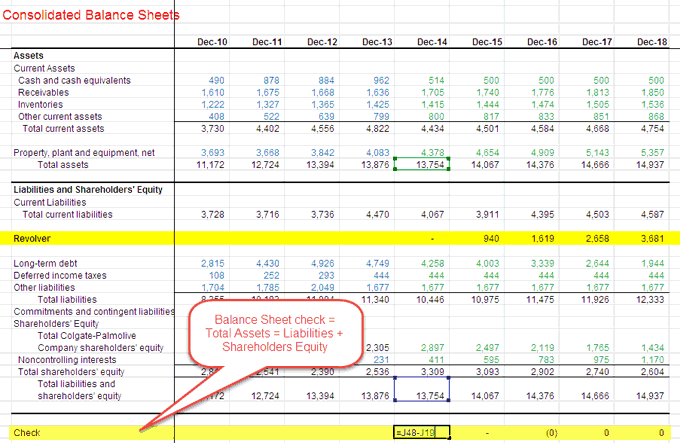 Step 11D – Link the cash & cash equivalents to the Balance Sheet. Deduct a minimum cash balance. We have assumed that Colgate would like to keep a minimum of $500 million each year. Also provided in additional information on Debt is the committed long term debt repayments. Step 12D – Link the long term debt repayments. Using the cash sweep formula as shown below, calculate the discretionary borrowings / paydowns. If you learned something new or enjoyed this Excel based Financial Modeling Training, please leave a comment below. Let me know what you think. Many thanks and take care. Happy Learning! worked as JPMorgan Equity Analyst, ex-CLSA India Analyst ; edu qualification - cleared all 3 CFA exams, FRM Charterholder, IIT Delhi, IIML; This is my personal blog that aims to help students and professionals become awesome in Financial Analysis. Here, I share secrets about the best ways to analyze Stocks, buzzing IPOs, M&As, Private Equity, Startups, Valuations and Entrepreneurship. Hi – thank for this very useful course template, but I wasn’t able to download the Colgate model via the download box? Would be grateful if you could assist! Please check your email. I’ve just sent the model. Dheeraj, you are a blessing to those of us getting into financial modeling with this piece. Thank you so much. Can I get the model/templates? There is a problem in downloading colgate financial model. i have tried several times but dint receive the mail. Thank you Dheeraj for such a great insight about financial modeling. Awesome work done by you. I can’t download your all of sample modelling in your blog. Could you email it to me? Спасибо за Ваш замечательный сайт и интересный обучающий материал. Прошу направить электронные модели по почте, так как ввод электронной почты в форму запроса не привел к отправке файлов. Hello Sir, please share the model via email, i haven’t received it yet. Hi, Can you please email me the template? I am unable to download it. Hi, I would love to try this Colgate model but I can’t download it. How can I get the templates. I have put my email address in but it doesn’t work. Hi Dheeraj, many thanks for this, you have just added a huge value. Meanwhile, it seemed the model failed to deliver to my mail, can you help me out with this please. Thank you Dheeraj for this great tutorial! Can you please send me the templates? Thank you dheeraj for this great turorial! Can youn please send me the templates? Sir, I am unable to downlaod the model. Kindly email me the same. Could you please email me the Excel templates as they are failing to download? Hello, I failed to download the model. I think the link is not available. Thanks Dheeraj for sharing this. Could you please mail me the templates? Could you please mail me templates. Thanks in advance! Please email me the excel models as well. Not able to download them. Thanks for the help. The content is great. Thank for everything you shared. Would love to go through this but like all others, don’t have the template. Hello sir, I failed to download the model. Could you please send me one copy? Thank you so much for sharing such helpful stuff. Could I have the excel template…. Also wrote earlier if you have any material on different types of valuation models…..
Hi, great article. But I have not received email of templates, could you please send me it? Hi Dheeraj. Thanks so much for the model tutorial. Kindly send me the model as i have signed up my email as well. Hello! Great article, very useful. But I haven’t received the template by e-mail. Could you please forward it ti me?! I have trouble downloading the file. Can you send me the templates to my email? just mailed the model. Please check. I would love to try this Colgate model but I can’t download it. How can I get the templates. I have put my email address in but it doesn’t work. Hey, great article. Just wondering where i can get the template. Thanks! i haven’t received the model in my email. Kindly send it. I have not received email of templates, could you please send me the files? Thank you for this detailed and simple explanation. I have submitted my email id but did not receive template email yet. could you please help? I am not able to get the financial model template even after signing up for download.It would be helpful to have good hand on of the above course.I request you to please look into it. I am unable to download the models, haven’t received it despite numerous attempts. Request you to please share it with me. Hi Dheeraj, thank you so much for this wonderful explanation and deep dive into the world of Equity Research, could you please send me the templates? I didn’t receive it through the emails? Indeed a good article, very informative and best one. I thank you for your efforts for writing this. Could I have the excel template? Please assist by sending the excel file. Hi Dheeraj, just want to say that this tutorial is one of the best I’ve ever seen. Please do more of these in the future, I’m sure a lot of people are also interested. Also, is there any way that I can download the model as I cannot see any link to download it? Same goes for the Box and Alibaba models as well on your other posts. Great post. Thanks for the effort. Hi Raghu, i don’t have such a model. This is so helpful for the course that I’m currently enrolled in. Can you email me the exact template in PDF? My email address is wawuah@yahoo.com. Thank you for sharing your great knowledge. Please is this the same basis for building Actuarial model. Hi Gafar, unfortunately, i don’t have an actuarial model. Really an amazing article. I have learnt a lot form it. Keep up the wonderful work as it really helped the upcoming professionals in the industry. Amazing job !!!!! Hi.. Could you share me the template for a deep study further? The one with all the ratios and the detailed study ? This is amazing. I have been wanting to practice financial modeling since I last took a course in 2003. Hi Johnavia, Thanks. I left JP Morgan in 2007 after falling in love with entrepreneurship and blogging. This site is wonderful, glad I found it. Could you please email me the deep analysis template as the template I downloaded seems missing some parts. Thank you! Do you have the template for this example? Sir Dheeraj, I actually appreciate what you are doing for all of us. This blog is amazing, and I’ll keep going learning as much as I could from you. I hope to be a good analyst like you, thank you for all!!! thanks Daniel. Glad you liked it. I have enrolled for paid venture capital course. I am unable to access it. Could you please guide me on the next steps ? I have just started using your course on Finacial Modelling through EDUCBA. Can you please send me the various templates used on the courses. Please assist by emailing me the MOdel. I loved you written model here. I want practice this same model myself. Can you send the Solved Excel Sheet, so that I can evaluate myself. Hey Dheeraj Very nice Article, I haven’t got the Financial model in mail please send it again. I signed up but haven’t received the files. Awesome article. I have seen very few such easy worded articles which make difficult topic like this look simple. I am unable to download the solved and unsolved excel sheets for finance modelling can you please arrange to send me. Many thanks for this wonderful work. excellent job!!! please could you share the template with me my email? I’m unable to download the Colgate palmolive Historical model through the link you have given. Could you please send me the link? I enjoy your site and appreciate your time and desire to share your knowledge with people like me! I am still reading this article and training particularly. I would like to ask you, at the moment this is Colgate case to learn. But if you have to do something similar but for a company which starts now where do you manage to take all the information from. Here we have historical data but when the company is new, in fact we do not have such data? I appologize if you have commented a question like this before! thanks Mariya. If the company is new, then it becomes tricky as there is very limited data available. Such models are very simplified and its complexity depends on the amount of information available. First of all i would like to thank you for giving us a useful model and some information about Financial modeling. But, can you please send me the download link of the Ratio Analysis in this course. Also, “Download the Colgate Palmolive Historical Model here” is not working. Could you share me the template for a deep study further? Thanks. have mailed you the template! I really appreciate the efforts you have put here. Learnt a lot. Can you please share the template with me too? I to found this very informative – thank you! Would it be possible to get a copy of the template? thanks Kim. Glad you liked the financial modeling tutorial. hai.. I have downloaded the excel sheets but later what to do I am not getting. Can you help me how to learn from that?? And where the videos will be available? I really appreciate your work and knowledge. However, I haven’t received the template yet, Could you please kindly send me the Colgate financial model? Thanks for sharing this info, will you mind to send me the model. Dear Dheeraj, do you have video training for this financial modelling? I would like to have it if you do. I am very interested to learn financial modelling, thank you for your great help. Yes, we do have video training course on Financial Modeling. Please do let me know in case of any information you require about this one. Please how can I get the videos of the financial modeling ? Simply amazing and a grand salute to your knowledge. I have a small query. Sometimes the previous figures that are given in an annual report are different from current figures of previous annual report. For eg the ebit figures of 2014-15 (previous figures) in the annual report of year 2015-16 (current year) and those of 2014-15 (current figures) in the annual report of 2014-15 (previous year) are different. In such a case, which figures to use? Only those who have opened the annual report and tried populating the historical figures may not this issue. You should always take the most recent data available for the model. In the case you suggested, you should take all the figures from 2015-16. I can’t seem to find the ratios in the templates that I downloaded. Is there a link to another download for them? Hi Alex, did you receive the template? Could you kindly mail me the template? I don’t have a ready a SOTP valuation model as of now. However, you can refer to SOTP valuation that i took in one of the detailed posts. Great Tutorial. I have one question though! So the company I am analysing has never buybacked thus there is no amount for the buyback of shares in the cash flow statement. With this issue, how do I come up with the implied share price (Amount outgo/no. of repurchased shares)and thus the Assumed current year EPS multiple (Implied Share price/Current year EPS). Please help me! 1. did the company announce that they are going to buy back in the future. If no, then you are not required to work on finding the share repurchase. 2. If the company did announce that they are going to buy back, then you may use the Industry average PE to find the implied share price of the stock. Many thanks for your great tutorial. I am updating this case study.. should be up in 2-3 weeks time. Could you send me the most up to date model (solved and unsolved) please? Thanks! I am working on the updated model to be released soon. Meanwhile, please let me know if you require the dated model? Hey! Thanks for this amazing tutorial. 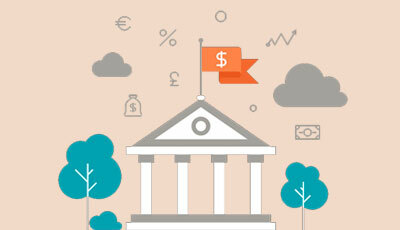 Can you help with the analysis of banking sector? As of now, I have not yet prepared a banking sector model. Will keep you posted on this. Thanks. You have some great points here. My take on those. #1 – Non recurring items – you are right on this. We should ideally remove all the non recurring items so that the projections do not include these one time volatilities. I did not do that in the model to keep the model a bit simpler to work with at this stage. #2 – You are right on the short term investments thing too 🙂 It should be included as well. I am working on a full ratio analysis case study. Will try and incorporate your valuable suggestions in that. Hey Kartik, just send you an email on this. Hi! so some of my questions may seem silly however i am very new to this! 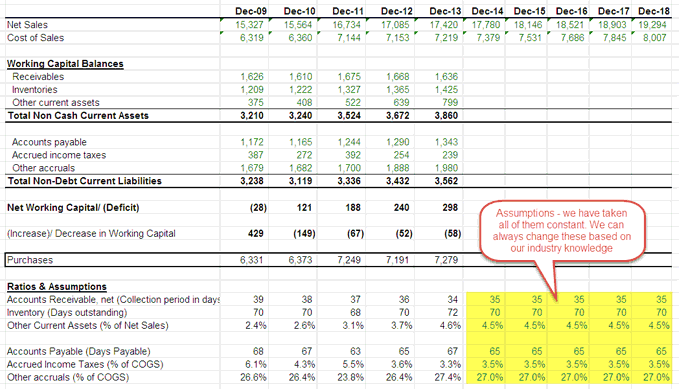 Under what assumptions did you come up with the figure of 4% growth in sales? I have taken this just on the basis of historical growth rates (though i should have investigated further on this). Thanks for that. So you calculated the average historical growth rates and used that as a basis for your projection? hi dheeraj! Thank you for all your efforts! it is much appreciated. I noticed that in the colgate palmolive model template the ratio analysis bit is absent. Could you please advise? I am currently working on updating this case study along with the Ratio Analysis. Should be up and ready in a few weeks time. Thank you so much for your reply! I look forward to your update. it is much appreciated. Has it been published yet? Yes Rohit, you can check the ratio analysis of Colgate here. I can get to the last step fine but the part around the revolver and the transferring the debt info the the BS are causing me serious trouble. Why do the numbers in the tutorial, the numbers calculated by using the formulas, and the numbers in the completed model not match? For example, in the 12H step, the revolver is 40, on the completed model it is 940, and via my model, cell K20 should be 112.3. What is going on? Did you take the same assumptions as mine? Also, once the model is completely linked, it goes through a circular reference loop and causes changes to the intial numbers that we may have taken. Got to know about this blog of yours while searching guidelines of finance modelling over internet. I am an amateur in this field though done with my mba. I really want to explore the finance modelling. So, could you please help me with this by providing some background and how can i pursue some practice on the same. It will be really helpful for me. Financial Modeling is primarily useful for careers in Investment Banking, Equity Research etc. You can think of this as the core of Research Field. You can learn Financial Modeling easily by downloading unsolved sheet and practice as per the given step by step instructions. Do let me know in case of any isseus that you are facing. For 3A, revenue projections using growth rates, how do you get the projected growth rates? for example: projected growth rate of revenue in North America is 4.0%. How do you get this 4.0%? I did not use much brains here. I have just taken this from the trend based on historical analysis. In this case, i was focussing more on ensuring that students learn financial modeling and don’t get lost much into the assumptions side. Is financial modelling for capex projects different from that of equity ? thanks. Equity research may not contain capex in lot of details as it is just a part of the overall financial model. However, from project finance perspective, Capex will become the most important driver. You should learn Project Finance Modeling. The ratios are shown int he tutorial but are not found in the template. Is there a reason for this? Can you send me the updated template please. An update to this is under progress. Will send you shortly. I love your work and thanks a million for such a generous offering. i am currently working on step 2 and have reached the calculation of operational profitability ratios. My values are close yet far from your values. 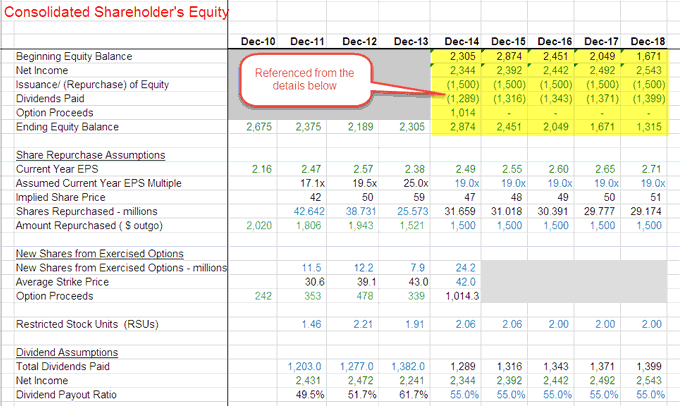 i request you to share the sheet in which you’ve done the financial ratios analysis. it would be of great help. You should proceed further as Ratio Analysis will not affect much of your financial modeling. An update to this Ratio Analysis is under progress. Will reply to you soon on this. Thank you for this tutorial. Its the best ever tutorial that i have come across. I just had one query how do you project amortization ? 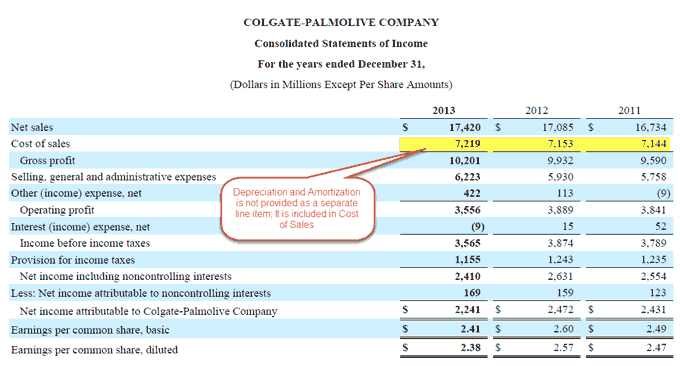 In this example colgate had given details of next the 5 years of amortization expense. But how do you do it when nothing is mentioned about the future expenses ? Thanks in advance. If not much information about the amortization is provided, we will proceed in the same way as the Depreciation schedule. Thanks Dheeraj for the free financial modelling tutorial. Much appreciated. Would you have a example for a SaaS startup valuation. As in initial years they make losses & their working capital mostly comes from borrowings or injection from shareholders. Unfortunately, i do not have the SAAs valuation model with me. It is indeed great info & new simple way of learning.Surely it will help all those who are in this field & currently working in F & A dept. Personally thanks for brushing lost knowledge. Would like to see more…. Can you please help me finding the templates because I am unable to locate the Template download option. Hope you received the model. Anyways, I have resend the same. I had filled the form already but still not received template. kinldy send me the colpal unsolved template. I just mailed you the template. Hi Dheeraj, can you please send me the Colgate model unsolved & solved? Thank you! I have just resent you the templates in case you didn’t receive. I filled out the form already but have not received the template. Would you be so kind to send me both the solved and unsolved Colgate Palmolive template? Please check your mail. I have resent it. I’m getting a DIV/0!error while referring the originally held constant diluted weighted average figures to the calculated “share outstanding schedule”, figures for the same. let me know how to fix this, i have done it in the same manner as yours. This is a typical circular reference error. You need to activate “Enable iterative calculations”. In excel 2016, it is present under FILE->Options->Formula. It’s been already enabled.Rechecked quite a times but still having the same error. Only the diluted weighted share figures has this problem and not the basic weighted average share figures. i can share the worksheet, if you can please look into it. 1. 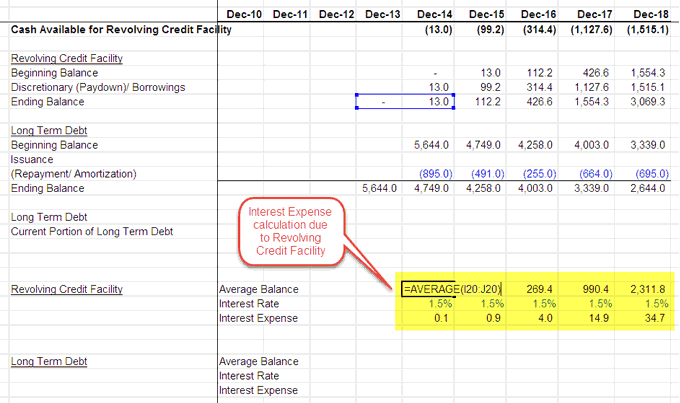 Interest income/interest expense from debt schedule is linked to INcome Statement sheet. 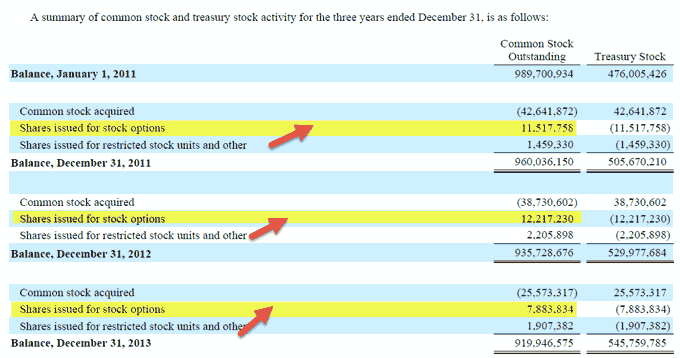 2. diluted number of shares are linked back to Income Statement. a) go to income statement – Copy all range of linked cells L14 to N14 from the debt schedule to let’s say Q14 to S14. c) Copy Q14 to S14 and Paste it back to L14 to N14. a) Copy all range of linked cells L8 to N8 from the shares outstnading to let’s say Q8 to S8. Thank you dheeraj the solution absolutely worked. But few things are still unanswered. One, the ratio analysis bit from the FM is missing. Secondly, how to make a reasonable assumption for an interest rate based on the information provided in the 10K report.Meaning,do you mean past interest rates from the 10-k, please specify. If above two did not help, could I send you my model and ask you for having a look at it? Woild be very helpful, as A do not equal L+S and this circular reference is blockong the calculations. sure Jan. Please send me the model. Will have a quick look at it. Few things: 1)The FM is complete yet incomplete as my balance sheet balances remains unmatched, this could be because my cash and cash equivalent year end balances are not similar to the minimum kept in the debt schedule. 2) The iteration solution you have provided above hasn’t worked, as it was already enabled. 3) How have you gauged the interest percentages for both revolving credit and cssh balances.IF 10K, please direct specifically. In nutshell, i would like you to please check my worksheet. If yes, i would be mailing it to you. Ehi Dude, this is amazing. I dont have received an model yet. Excited to start. Please check you email for the template. Did you fill the download Colgate model form. Else, please mail me. Will send you the model. 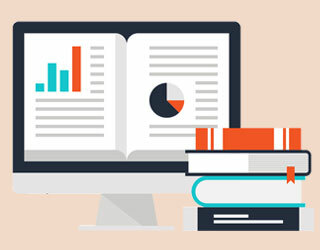 Thank you for your kind and generous free course for financial modeling, I am looking for a come back in finance career, it is very much useful in both brushing up basics and in-depth analysis. It will be a great favor to me, if I can get excel sheets e-mailed. Did you signup for the Download Colgate Model at the start of this post. If yes, you should get it automatically. If you have still not recieved, i will email you the models. This tutorial seems to be really informative. Do you happen to have a video tutorial of the same? Unfortunately, i have not prepared financial modeling video tutorials as of now. First of all thanks for the detailed model. I have doubt related to Depreciation and Capex calculation. 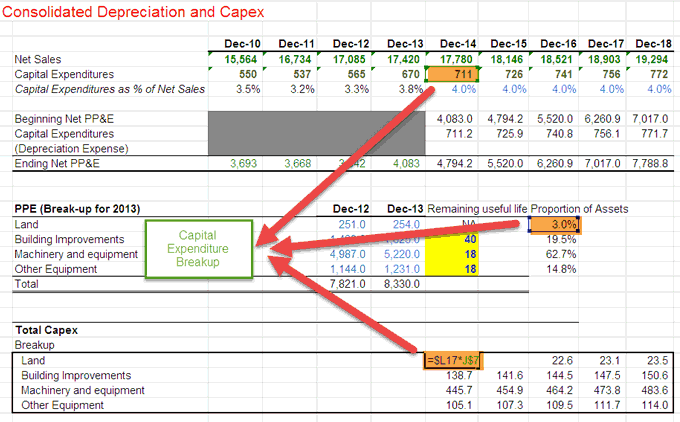 In 2014 the calculation of CAPEX(Building improvements) is 1.7 and in 2015 it is 3.5 and 1.8 . I want to know why is 3.5 taken into calculation. This is a mid year convention. If the capex installation took place on Day 1 of the year, then you must charge full depreciation. However, while estimating, we do not know the day when Capex was installed so we take Mid-Year convention (capex installed at the middle of the year). With this we should charge half the depreciation for the installation year (not the full year). I’m so lucky to find this free financial modeling course. Thank you for your amazing work done! It is very detailed and covered almost everything. Can you please send me the template? The link seems not working. Thanks Helen! I am glad you loved this Financial Modeling course. I have sent you the templates through mail. Please check. Do you of a certificate of completion for this training, we need 45 hours of financial management training? Unfortunately there is no certificate for this Free Financial Modeling Training. I didn’t get your second question about 45 hours of financial management training. How did you get the 4.0% in YoY growth (as well as the other numbers)? in segmental growth? I don’t see how you calculated that and it doesn’t seem to be an average of the past numbers. for the sake of convenience, I have taken this as some number based on the ball park historical numbers. In actual scenarios, we need to more industry research to put the growth numbers. Would an error like this be acceptable? This kind of error is completely acceptable. it is ~0 for all practical purposes. Great to see that you were able to prepare the full financial model. why don’t you try some other company now? Unfortunately, i have not yet prepared the video tutorials. Please let me know if you have any questions. Thanks for posting, this is very useful indeed. I can’t seem to find the ratio analysis section of the spreadsheet, could you please send it to my email when you get a chance? Or point me towards it on the site. Thanks for your question. I received your email as well. Ratio analysis sheet is a bit dated. I am working towards updating the same. Will send you shortly. Assuming that you worked through this Colgate Financial model, any new Financial Model may take anything between 1 day to 10 days. It depends on how robust modeling you are looking at. Normally the first independent financial model is the most challenging and exciting! Thereafter, it will be easier for you to interlink and fine tune other models. Could you send me the Ratio Analysis too? Thank you! I am yet to work on the Ratio Analysis template. Will update you on this. I have learn financial modelling back two years and now forgot everything but your course help me to remind everything. Dear i am doing job and working as a Manager accounts in a manufacturing firm. I want to ask from you that where online i can made the models for people and sell so i can generate more income in my free time ? Ofcourse preparing financial models can be wonderful. You can use your models commercially or as a base for financial advise. First, are the financial modelling for biotechnology sector and pharma sector the same? Is it similar to a financial model done for your colgate example, except you use a pharmaceutical company 10K and/or biotech company 10K filing? Is it possible to just purchase module 35 (Financial Modeling – Pharma Sector) and 41 (Financial Modeling – Biotechnology Sector) of the advanced financial modelling courses? More of less all financial models are prepared in a similar way. All financial models start from the Income Statement and later move to Balance Sheet and Cash Flows. Only the revenue and cost built up statements and assumptions may change a bit depending on your understanding on Pharma/Biotech sectors. One exception to this is the bank models (e.g. 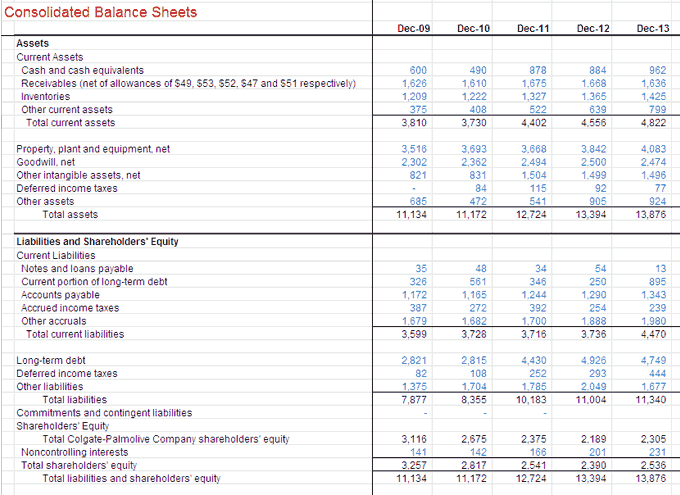 JPMorgan) where balance sheet is prepared and later on we move to the income statement. first thanks for this very helpful tutorial! I have one question, why do you divide “Earnings per common share, basic” and “Earnings per common share, diluted” with 2 in your template? I have divided this by 2 due to the stock split of Colgate. Since the denominator increased by a factor of 2, the earnings per share should be divided by 2 to get the correct picture. For the consolidated shares outstanding, i’m unable to figure out how you arrived at the values- which are in the 900million range. As the annual reports show them to be in the range of 400 million. It is due to the stock split announced by Colgate. In leverage buyout models, would the integrated three statement model be as advanced as this example? Hi Karthick, I have emailed you the models. In the working capital schedule, how did you calculate the (Increase)/Decrease in WC for 2009 of 429? I understand how the 2010, 2011 etc.. values are arrived at. But for 2009, since 2008 data is not shown – do you use some other method? Sorry, i figured it out. Your website is excellent, I have used it many times as a reference for modeling. I am also a member of eduCBA – I have the investment banking bundle. I am unable to balance a model – I have a constant difference, which doubles every year. Would you be willing to take a look? Thanks. Sure. Please send the model. grateful. It is very important for me to find it. Thank you in advance and waiting your reply. I do not have the these templates. I think CFA is the right thing to start with. At least, do plan to give CFA Level 1 ASAP. In addition, you can do these financial modeling courses to solidify your concepts practically. First of all i would like to thank you for all the detailed courses and the time that you have taken out to make them. However, can you please send me the download link of the Ratio Analysis in this course. Also, “Download the Colgate Palmolive Historical Model here” is not working. Will send you the historical financial model with ratio analysis soon. I have some problems to download the files. Could you please send it to my mail directly? Sorry for the inconvenience caused Milan. I have sent the models to your email id. Thanks Sir for this financial model article, it is quite useful & worthy too to know how to make a financial model in an easy go. Thank you for making it easy to understand its fundamentals properly. Thank you for enlightening us with your great articles on finance. Your articles are truly appreciable; they are easy to understand & grasp. 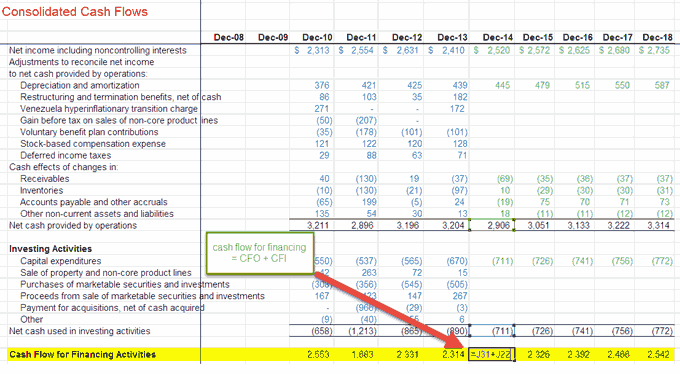 This financial modeling article is very interesting to know the performance of the companies. Thank you for teaching through the mode of an article how to prepare a financial model. Thanks Saira, please do let me know incase you have any questions! Simply amazing. 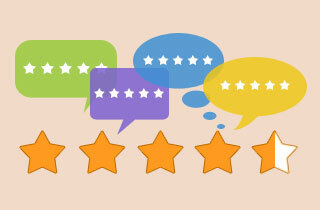 Dheeraj thanks a lot for your contribution, extremely helpful. Providing a thorough knowledge on each and every step caught my attention. Thanks again for the contribution, and yes all the new posts on your site are simply awesome as well. Thanks Vivian! Do let me know if you have any questions. 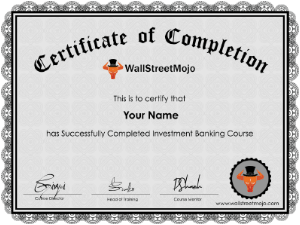 I am glad that i found this free financial modeling course on wallstreetmojo. This is a complete step by step training in simple way. Really helpful for anyone who is naive to financial modeling. The training on preparing financial models that too for FREE is awesome. I really appreciate the way it has been explained step by step and in a concise manner. Looking forward to learn some other advanced modeling lessons as well. Thank you Mitesh. The advanced modeling sessions are planned and are definitely coming in 2016. This financial modeling guide is great. All concepts are explained to the point and the explanation is crisp. I am now going to try making one financial model. Thanks for the help! I am glad you liked the financial modeling course. Please let me know if you have any questions. thanks Joseph. Please do let me know if you have any questions. Thank you Dheeraj Sir for your informative article on Financial Modeling. Truly your articles are amazing and helpful. The way you explain the things through your articles is too good. I love your way of explaining the things in the form of examples. I intend to know what does actually financial modeling means your this article has helped me a lot in understanding about financial modeling. This post is awesome Sir! This can really help freshers like me understanding financial forecasting. Thanks a lot and keep providing knowledge to us from your vast industry experience. This was very helpful as I prepare for an interview where I might be asked about financial modeling. I learned so much. Thank you for creating this free course! Thanks Dheeraj for this tutorial. You made it appear simple. It looks great! 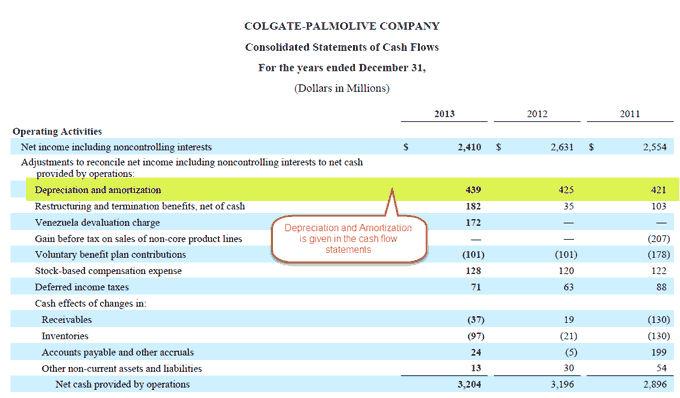 I also would like to request for an email of Solved and Unsolved Colgate-Palmolive Financial Model. Many thanks. I have mailed you the financial modeling templates. I just emailed you both the models. Thanks so much. You are a guru! You must analyze the stock market with impeccable precision. What’s your average annual return? I know it must be high! Thank you Stacey for the motivation :-). i have sent you the models to your email id. Though i am not tracking GoPro, I will check and get back to you if i can evaluate this stock. You need to just download the Colgate Model (from the form at the start of this post) and start learning financial modeling. but i am confused about some other course. I am still thinking either to join CFP or CFA. I am not sure that joining this course with CA will be better for me? Outstanding work mate. None of my finance courses in B-school taught me financial modelling / analysis better than the masterpiece that you have created. – Step 9C: How have you used the information “authorised the repurchase of upto 50 Million shares of company’s common stock” into the model? I am not able to understand the link. Step 9F: RSU of 4.539 needs to be recognized over a weighted average period of 2.2 years. So, shouldn’t we be recognizing 4.539/2.2 in 2014, 4.539/2.2 in 2015 as well. Why have we assumed 2.0 in 2015? Thanks for the encouragement and sorry for the late replies. This comment got dumped in the spam comments i received. Step 9C – as the company statement said that they are authorized by repurchase update 50 million shares, in the model, we just need to be careful that we do not repurchase more than 50 million shares. If you check 9C, you will note that each year, we are repurchasing around 30 million shares. 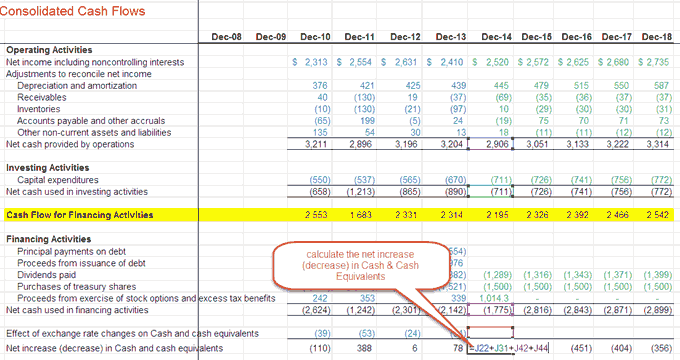 Step 9D – The RSU figures are mentioned in the summary table i provided. its in the 10K. Search for “restricted stock units” and you will be directed to this table. 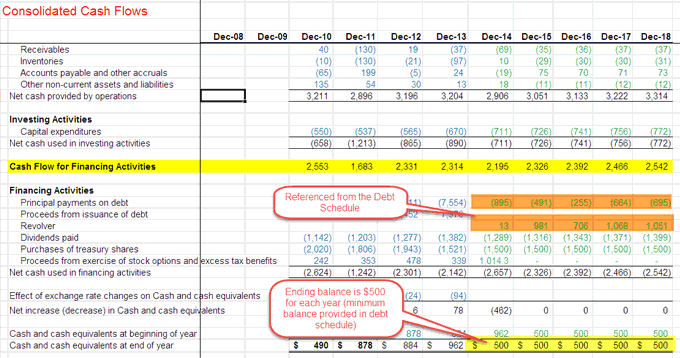 Step 9F – good question, why i divided by 2.0 instead of 2.2 years that was accounted for earlier. This is just an assumption that i have used to keep the calculations simple. Many thanks for your useful information, it is a boon for me. could you email it to me ? I have mailed you model. Let me know if you need anything else. Hi you, thank you so much for your free course! I just want to ask you where i can find the Solved of 2CDE, i didn’t see it in IS. I realized that i didn’t provide those in the solution. I am writing a separate note on this. Will update you on this shortly. I took a finance course 10 years ago, do you think I need to take a refresher course? It yes, can you please recommend something ( either an online tutorial or a book ). I work as a senior accountant so I’m familiar with most of it. Just curious to know what is your objective of taking a finance course? I can guide you further based on your inputs. Dheeraj,Thank you very much for taking time to share such insight in financial modeling.Why do you subtract 1 from the base year in the horizontal analysis formula. What do you call that. Dheeraj, I have known why. It is simply to arrive at the net movement. Thanks for the lovely tutorial. My liquidity and solvency ratios are varying a little. I am unable to identify the error. This is Step 2C. For example my inventory turnover from Dec-09 onwards if 5.2, 5.2,5.4, 5.2 and 5.1. However urs is 5.3, 5.2, 5.6, 5.3 and 5.2. The formula used is Cost of sales from IS and inventories from BS. I am writing a note on Ratio analysis where i am covering Colgate as an example. Will keep you posted on this. Great Work. Could you help with Financial Modelling of a New Mfg. Co. with Loans and Loan and Interest Repayment schedule and Depreciation Schedule. Unfortunately, i do not have the manufacturing company financial model. Regarding the circular reference in step 10D.How do we go about getting rid of this circular reference. I am getting “DIV” error. This is important. Follow the following steps to remove the DIV error. You cannot get rid of circular reference as it is inbuilt in the core modeling exercise. 1. select the columns with DIV error and delete it. You should be able to see the corrected output. Thank you so much for publishing this – it is wonderfully written. I was just wondering, would you mind including all the ratio calculations in the solved template for verification purposes? As I couldn’t locate them there. Cheers! I I am working towards writing another blog post completely dedicated to Ratio Analysis. Will update you once its posted. In step 4E we have to populate 6 fiels in Working Capital Balances. a) Receivables – here we calculate the receivables turnover in days. We note that the receivable days is between 34 – 39 days. So going forward, we take an assumption that receivables days will be around 35 or so. Based on this input of 35 days for colgate, we back calculate the receivables. Please refer the Colgate excel sheet solutions for further details. b) Inventory – here we calculate inventory days and perform the same approach described above. You have beautifully explained and demonstrated the flow of the FMCG company model. Thanks for it. However, I wish to value a company which is still in the nascent stage of development, i.e., the company does not have any revenue from its product (its product are in the pipeline stage). then in that case how you value such a company, like any early stage pharmaceutical/biotech company listed in the stock exchange. Could you please build such model? thank you. Currently i do not have such a model in place. A company that does not have any revenue from its product till date will be valued on the basis of how the growth may look like once they launch the product. Cant detail things much here without knowing the whereabouts of the company. thanks a lot for the financial model training and it was great experiance. it really help me a lot but in the end i fail to tie a balance sheet i don’t know where i went wrong. please can you help me out?? need further guidence….. Please email me the problems that you are facing in the financial modeling exercise. Its amazing to go through this. Really great work. Thx a lot for this website!!! But I stock in the step 4E. I do not understand how do you project the Receivables, Inventories, Accounts payable and Accrued income taxes. I need some help here. I’m quite loving your website, it has helped me alot! I well made!!! In other hand, I’m Stock in the 4E step. I do not understand how do you project the Receivables, Inventories, Other current assets, etc. Is with the proponcional os Net sales and Ration Assumptions Drivers??? I’m not reaching the same numbers that you projected. Try checking the calculations again. the numbers should match. Thanks for your generosity to the world. How will a similar model work for a private firm? I an trying to do a DCF for a private firm and am looking for benchmark financial and DCF model for private firms. Can you recommend any sources or do you have a reference model that we can refer to? I am sorry i do not have such a model at this stage. However, stay tuned. will update you soon on this. Please send me your course details along with commercial over my mail id. this is a free course. You just need to download the templates and start learning! Great tutorial, thanks for the effort put in. Some thoughts though, as we do calculate most areas that would be classified as operating expenses, why not link up those once to the Rev Estimation as well. As it is now the only thing determining the Net Income estimation is an arbitrary estimation of COGS and OPEX. I might have missed something in regards to this but would be glad if you could give your thoughts on it, as Earnings would be an important factor to determine share price. You are right. Its just about how you think about certain assumptions. For example, advertising expenses should move with Revenue (can see the direct links) so Revenue linkages makes sense. If you are comfortable with Revenue assumption linkages, you can also take that. I have seen many analysts doing so. How is your model coming along? A lot of thanks for sharing your knowledge! 🙂 As a junior at college, I really appreciate the precious hand-on lecture. I have a question though. 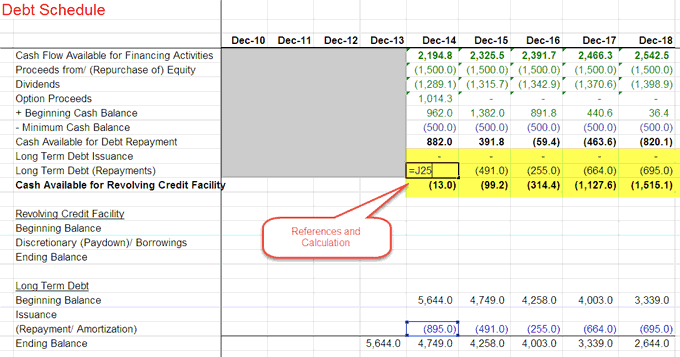 How did you calculate “Accounts Payable (days payable)” in working capital chart? Your Tutorial is really nice and I learnt a lot of the mechanisms from it. One question. I have already tried to go through the model and I got stuck during the equity section Step 9C to find out he implied share price. However at that time, my income statement is still not finished as the interest expense statistic is not ready and hence no EPS is derived. If I reverse the step to calculate interest expense first, equity data and cash flow from financing activities needs to be used. How should I solve this problem? Many thanks!!! Thanks for your note. You need to carefully follow each step one by one without skipping any. This also means that you have to follow the same sequence as suggested in this tutorial. It will be great if you could send me your Financial Model – i will have a look at it and see the exact nature of the problem. I can surely help you out on this. Please let me know the questions that you have. Awesome financial modeling tutorial. I will be working on this provided unsolved Colgate financial model and then hopefully be able to do my own model of another company. Once completed I am going to try and show interviewers what I have accomplished and hopefully land a financial analyst entry level position. Many thanks! Do let me know if you run into any issue while practicing financial modeling. I really appreciate the effort you put in to come up with this very nice tutorial. I have one main issue anytime i look at a financial model, Please i would like to know how to check if the financial model built is reliable in terms of the accuracy of the forecast. Accuracy of the forecast can be done by revisiting assumptions and checking the same with the publicly available resources. For example, in the press releases, if the company management said that they will spend $200million on capex, then in your model these numbers should match. Likewise, in results and conference calls, management do provide their guidance on key numbers like Revenue, profit etc – broadly these should be in line with the estimates provided. Also, you may want to check the consensus figures to check if your forecasts are in sync with other research analysts or are high/low. Thanks a lot for the knowledge that you are furnishing through this portal. Request you to please assist how you forecast the numbers of revenue growth and whats the best forecast method i can use for further forecasting? there is generally no best method to forecast revenues. Each depends on the availability of data and your time. if you are ready to spend a couple of days/weeks on forecasting revenues (like financial analysts), then you may want to go as granular as possible for revenue forecasts. For eg. FMCG companies forecast can be done geography wise, product wise or both. If full scale data is available then you can do forecast on the basis of each product (there may be 500+ products). Though such an approach is time consuming but is often recommended as it more robust. This is really amazing stuff Dheeraj, you were able to break the financial modeling concepts down into an extremely digestible form for ease of learning, much appreciated! I was just wondering, is there a follow up post on how to conduct a scenario analysis? Once again, many thanks for your great work! Hi Dheeraj, Thank you for this tutorial, Dheeraj, i need your guidance pls, I am 32 years old,BCA graduate in job and interested in to be a Equity research analyst. Please guide me. Can you please let me know what help are you looking forward to. quite invaluable stuff. did you leave a link for the videos?? or did i miss something. otherwise I will say well done for making this free as well. I desire to learn to be a finance guru ALMOST like you. However problem is i have no understanding and dont know where to start from. I really admire you finance people but i have no knowledge and i am ready to learn and hopefully get a CFA qualification for myself as it is not common here in Ghana. Can you advise on what i need to do and learn to at least be able to understand what you have done inside out and get ready to do more complex things? I love to project figures naturally so i trust i will enjoy finance but i need to know how i can start understanding from scratch so i can understand all about finance including NYSE, derivatives, options reading and interpretations. I want a career in finance and set a company later when i have money. Thanks for your kind words! I think getting a CFA charter will be first step towards a career in Finance. I strongly recommend the same considering your enthusiasm for Finance. Thanks Mr Dheeraj sir, for sharing this knowledge. I need this for my financial self study. Love the way you present all the information And the memes too. I am interested in building my finance career experience in Financial Modelling and i have found these materials as a good starting point. I am impressed. Dheeraj, very deep insight about the subject and the way you have put in here is symphonic. This is to supplement you already perfect share of wisdom herein above that a Sub-head Shareholders’ Equity Schedule could be a shade more elaborate. Its the best available online material. People who have FM-phobia will overcome there fears by the end of the page. Naman, Thank You so much for this feedback. I feel humbled. Thanks very much for sharing the template. It is an excellent tool to understand the topic financial modelling. The model template is excellent. 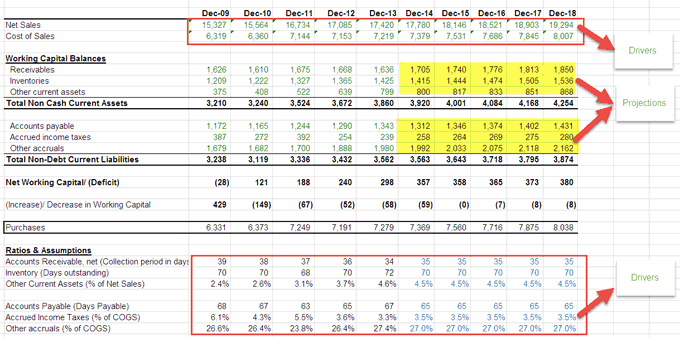 Can we get new sheet/ addendum wherein we can find actual performance v/s projections..
I’m afraid this is not an appropriate place but I have a question regarding depreciation schedule in Alibaba IPO model. You set the useful term of computer equipment and software as 3years, however you continue to book the depreciation cost after the forth year. For example, the capex of computer equipment in 2015 is 4,193. But the total depreciation generated from this capex is 10,482 from Mar-15 to Mar22. This end up a negative number of PP&E in Mar-22, -1,813, cell in the same sheet. Also I think you are using wrong useful life for all of the three PP&E. Although you set 4 years as the useful time of computer equipment in , you apply 3 years in . Could you show me the correct calculation? Hi Dheeraj, Thank you so much for this financial model tutorial. Thanks for the great tutorial. I have doubt on the debt schedule. Why do you consider dividends to be paid out before arriving at the cash available for debt service? Doesn’t debt have preference over equity? Dividends are returns for shareholders. Basis the performance of current year dividend is distributed to shareholders. On the other hand cash sweep is essentially a cash surplus after considering all the cash operations for the year. Therefore, the preferential treatment to service debt before equity does not arise here. Its just like earmarking every possible cash outflow before deciding upon to repayment. Today I was going through the Colgate Financial Model. I realized one thing, that the way the revenues of Colgate were forecasted is more kind of an approximation. Simply taking AM/GM would limit our forecasting. I am thinking of this, please let me know if the following approach will correct or not? What I believe is this -> Although the industry & the firm are at mature stage, but I was thinking of another approach. The another approach is to see through the sales-gdp regression analysis. If we find that the p value is 0.05 & both the variables are dependent, one can find out the sales. Even one can do the same thing with the market size as well & then have a look at the Annual reports to see the future plans & adjust the computed sales according to best case & worst case scenarios. Is my approach kind of more complicated/incorrect, please let me know. Could you please help me out at my query. I see a point in taking the approach like you are suggesting. Would call this as a mathematical approach to projecting revenues using regression analysis. Unfortunately, I have not yet seen many models where this technique is primarily used to project revenues. One reason could be availability of the data to make it statistically viable. Additionally, the approach I suggested is too simplistic. A research analyst will do well do dig into the segments, product portfolios and geographies to find the growth rate of sub parts and then add it up. However, it takes lot of time and I avoided presenting those complex forecasts at this stage. Thank you very much for putting this tutorial together. It is an amazing guide… the best that I’ve seen. I do have a quick question for you though – why is it that circular references are allowed to exist in this model? Specifically, I am referring to the circular reference found in the “Basic Weighted Average Shares” and “Diluted Weighted Average Shares” on the Income Statement. In step 8A, we were told to assumed that the future number of basic and diluted shares will remain the same as they were in 2013. However, in step 10D, we linked the basic & diluted weighted shares we calculated on the Shares Outstanding Schedule back to the Income Statement. Since we were only able to calculate 10D by assuming 8A, why do we plug the calculated amount to replace the assumed amount? Hey Brian, you just need to download the excel sheet from the form provided above. I will send you the excel sheets in this doesn’t work for you. Note: Maybe I’m wrong, but I don’t think you mention to adjust non-controlling interest on the balance sheet, so I ended up with an imbalance for about half an hour until I realized that was the problem. THIRTY YEARS IN FINANCIAL SERVICES, I CAN HARDLY THINK OF A BETTER TREATMENT OF FINANCIAL MODELING. Hi Dheeraj, first of all, thank you very much for your work. I had a problem downloading the template, despite I´d tried several times (using different email adress) the email didn,t arrive, neither to the Inbox nor to the Junk box. Is it possible to download it in any different way? there is a perfect blend of all the classroom teachings we have had during graduation/post-graduation years to real life examples in terms of their implementation and execution. i look forward to more such courses! Keep up the good works !! Hi Dheeraj, Its always been rewarding and intellectual feast for me to learn things from your case studies. Kudos! Great Work on Colgate-Palmolive. Thanks Santosh for your kind words. I am glad you liked the tutorial. Thank you dheeraj for such a great insight about financial modeling.awesome work done by you. Thank you Sandeep for your kind consideration. I hope you liked the Financial Modeling Training Tutorial. Thank you Dheeraj! Can you please answer my email about the Alibaba Group? It was sent about 2 weeks ago. And just one more question…how do you estimate the percentages for the further years? Like the growth rates (4,0%; 1,0%; 1,0%; 10%; etc) at the Segmental Information (Income Statement of Colgate). Amazing work. Thanks for making it simple. Get back to you if need be. Thanks for sharing this well explained tutorial. 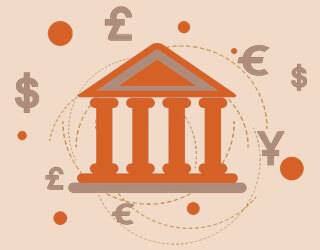 Can you share financial model related to Indian banking sector. Thanks Sudeep. At this stage i do not have a banking model, however, I do plan to write about it in my coming posts. Thank you very much. I really appreciate your expertise in breaking this down to a very simple methodology. There is no limit to how far I can take this. Thank you again. I am glad you liked the tutorial. Hope this proves useful. Thanks Dheeraj for such a wonderful explanation of financial modelling. Can you share some sector specific template like banking and oil& gas and important ratios that are covered in these sectors. Thanks Nidhi. I look forward to preparing a banking sector model pretty soon. Will let you know about the same. Hi Dheeraj, thanks for this awesome tutorial. When i try to open the Financial Model of Colgate, it gives me circular reference. Does the model contain any errors or am i missing something? Hi Rachael, many thanks for the download. This financial model contains circular references as the financial statements (Income statmements, Balance Sheet and Cash Flows) are interlinked. Circular references come when we link the Interest expense from the Debt Schedule to the Income Statement. You can remove the error by going to File->Options->Formulas->Enable iterative calculations. Sure Avinash. 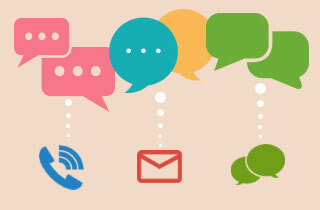 You can reach me at dheeraj (at) wallstreetmojo(dot) com. Thanks for a clear ,useful framework for the fiancial modeling setting. Thanks for sharing. Amazing work. Thanks Neeraj. Hope you enjoyed this Financial Modeling tutorial. Many thanks Dheeraj sir for this financial modeling tutorial. This is an epic Financial Modeling tutorial. Bookmarked for reference. Thank You. I will followup with more questions as i try the unsolved template.